Having stopped off at South End, High Street, Bassingbourn (Cambridgeshire) on a cheeky pit stop to Norwich, our pie needs were met by The Hoops Pub in Bassingbourn. Union flag bunting lined the thatched roof on the way into the pub, towards their friendly staff who kindly clarified what a “Polabe Pie” was. 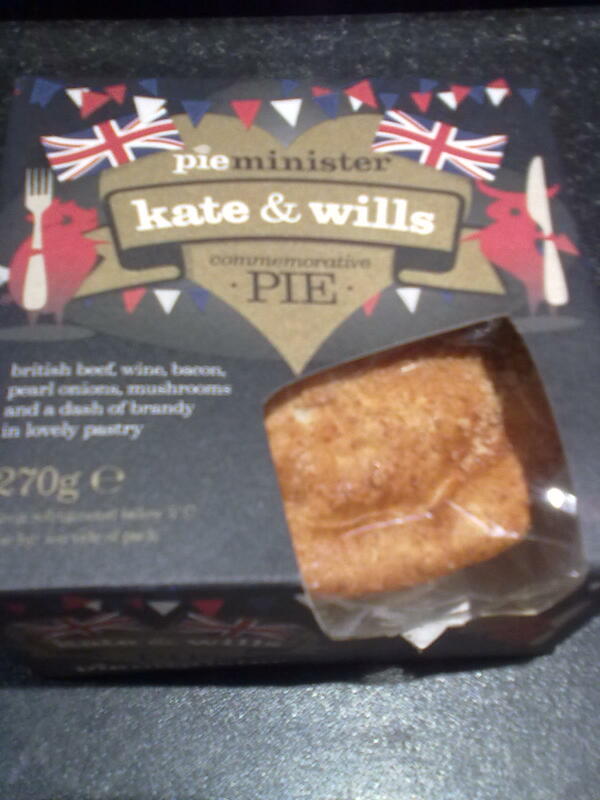 For this Royal Wedding Bank Holiday weekend there was not only the union of Prince William and Kate, but in our pie we had the union of Pork, Lamb and Beef chunks [hence the Po(rk)La(mb)Be(ef) name]. The main disappointment was the lack of side and base pastry (for this was in effect a meat stew served in a little dish with a pastry lid on top). 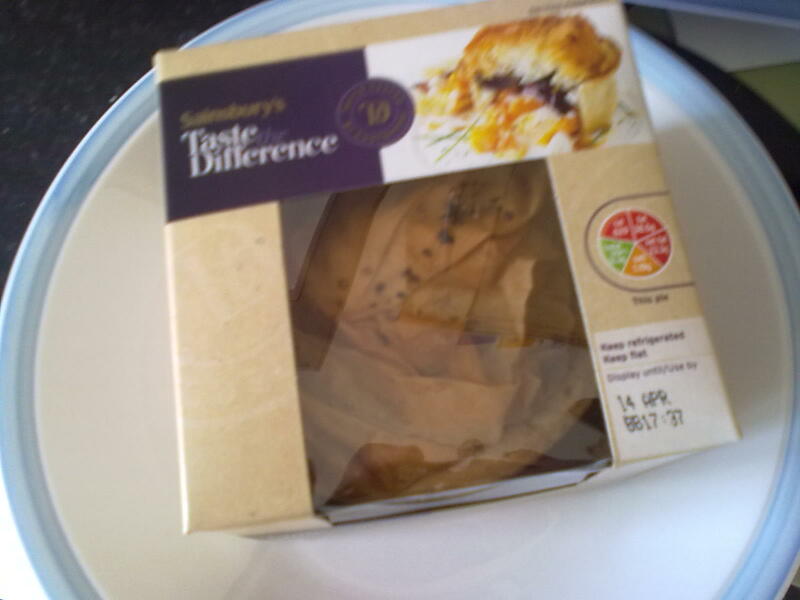 And a side disappointment for one of our reviewers was the lack of poultry/chicken in the pie, which had to be clarified as not actually being on the contents and therefore was never going to be in his pie! So how would the top crust only pie fair with our reviewers? Would it be unbullevable? Could ewe rate it highly? 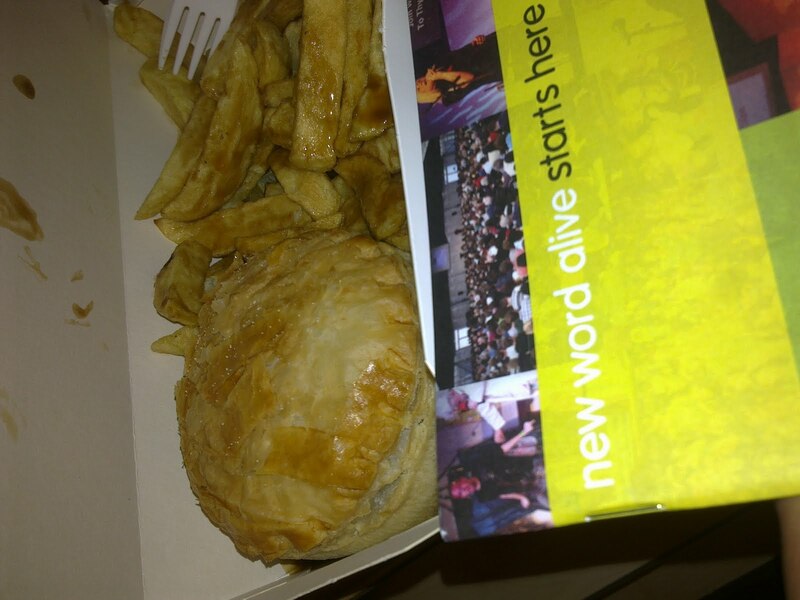 Or were the pub telling porkies when they label this as a pie? 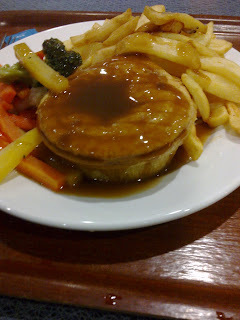 In addition to this, our third reviewer had a Steak and Ale pie from the same establishment, commenting that he really wanted to enjoy this pie and it did look impressive as it was laid down in front of him, but he soon realised that it was another top-crust pie and similar to ones he has eaten before. Putting this aside for a minute, the majority of the content was gravy but the morsels of steak were very nice. He’d have liked there to more than just meat and gravy in his pie. He’d give it a score of 4.35/7. All in all, it was glorious to stop off and eat some pie but the lack of pastry left us Hoop-ing for more. continue reading "Land of Hoop and Glory?" continue reading "Do too many Cooks spoil the pie?" I’m gonna cut to the chase here. 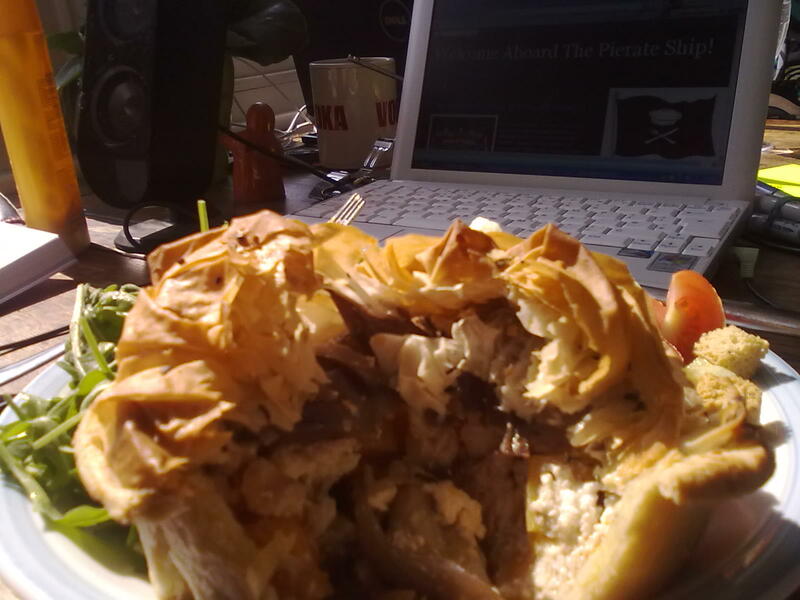 I don’t like writing pie reviews for pies which have not ticked all the boxes on satisfying the pallet. 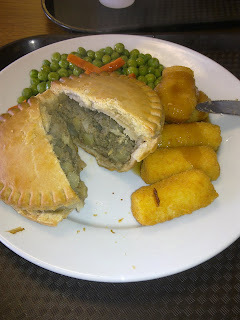 And while I understand that I perhaps have a slightly higher expectation of pies than the typical punter, I was quite disappointed with the Meat and Potato pie served up at a Haven Holiday site I visited in Pwllheli recently. The staff are very nice, the general standard of food is good for a busy mass-produced restaurant, but sadly there does not appear to have been enough time and effort put into the pies on the menu. Firstly, I’m always hesitant when the menu says “meat pie”, as I’m unsure what kind of pie producer would be so uncertain of its contents that they could not specify the meat or meats present in said pie. 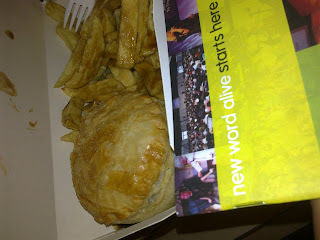 However I am assured “meat” is a typical Northern labelling of pies, and I was in North Wales, so I went for it anyway. And while the content of the pie was edible, if not appealing on the eyes (see photo), the pastry really let the side down in quite a major way. The pastry was far too solid, making it difficult to cut and it was far too dry. 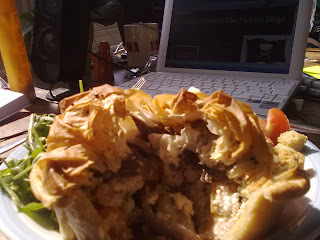 Fortunately I had taken additional gravy, but as you can see there is no lovely runny gravy oozing out of the pie either. The meat was not obviously recognisable either. continue reading "Are you Haven a laugh?!" continue reading "And I'm "filo"ing good"
If you've been so much as awake for the past few months you'll have heard of the Royal Wedding between Prince William and Kate Middleton. While we of course extend our congratulations to the happy couple, I've also become increasingly amused by some of the wonderfully wacky "commemorative" wedding souvenirs. 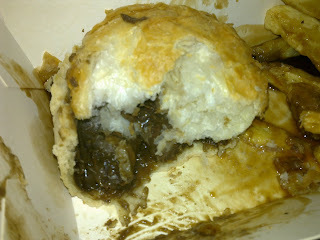 And the wackiest I've come across so far is one that is the closest to my heart: a commemorative beef and brandy pie from Pieminister. Will it be any good? Described as "British beef, wine, bacon, pearl onions, mushrooms and a dash of brandy in lovely pastry", this sounds like a premium quality pie. 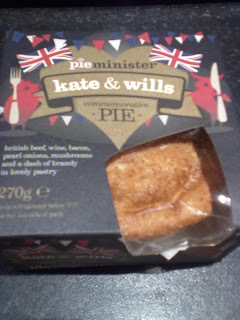 And at a princely sum of £3-4, I am expecting this to taste like a quality pie too! After a bit of time in the oven, I crack open the crispy pastry to reveal the glistening brown contents. The quality is obvious as I take a bite of the beef - its melt-in-the-mouth tenderness is a real testament to the great reputation of the Pieminister brand. This pie is royally fit for a King. The pastry is indeed lovely, and the delicate notes of the wine and succulence of the beef is married perfectly with the kick of the brandy. Whatever your views on mushrooms (I am a disliker), you have to agree that they add further body to what is already a rich and original gastronomic experience. I hope Buckingham Palace are to serve these on the wedding day - they should soon be adorned with the Royal seal of approval. continue reading "The perfect marriage of beef and brandy?" So once the pies were served up, did they taste smashing? Or was I left with only backhanded comments rather than feeling the pie had hit the back of the net? Would I need to drop shot these pies into the nearest bin or was I onto a real winner? 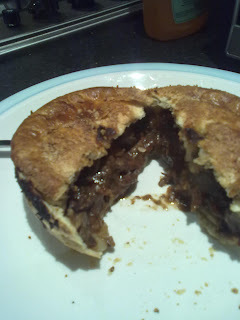 Well I consumed a Steak pie on one evening and a Beef and Onion pie on another evening. And the good news is that they were both pretty reasonable pies. 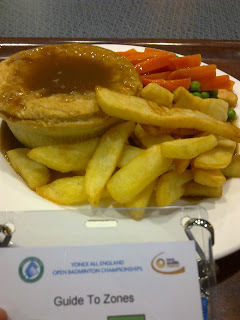 While I personally wouldn’t have recommended spending the £7.50 to have this level of pie, chips and veg at the NIA cafe – after all, this wasn’t the number one pie in the world – I was certainly happy enough to enjoy the whole pie in the comfort of having an £7.50 meal voucher to cover my food. 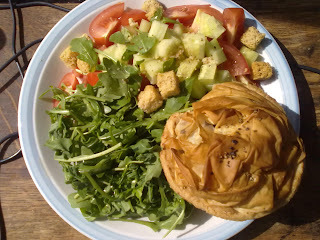 The pie was covered in nice pastry and the fillings were good. Portion wise, the pie could have been a bit bigger and the base pastry a bit less soggy, but all in all the pie was very pleasant. If I was in the NIA again sometime, I certainly wouldn’t stop myself making a big racquet in requesting another NIA pie. continue reading "British Pie Week hits the National Indoor Arena!"